One of the most annoying things about following any kind of art is the constant portrayal of the artist as some sort of misunderstood genius. For some reason our society likes to romanticize the artist, picturing him (or her) as unbeholden to any sort of commercial interests, creating art for himself and only himself. If the art finds an audience, that's fine. If not, it's no loss, because the art was all about "radical self-expression" anyway. There's a little bit of truth to this notion of the "Romantic Genius", and it allows for the artist to reflect on oneself, to try and cope with their vision of the world. But too often it simply devolves into aesthetic solipsism, as the artist refuses to edit or revise his work, merely throwing out any thought that comes to mind without regard for audience and marketability. We tend to have an idea that art and commercialism can never intersect without the art becoming adulerated by the immoral forces of commerce. But the truth is that art and commerce have been interacting for hundreds of years; it's certainly possible for good art to be commercially viable, even popular. Not all good art sells, and not everything that sells is good art, but I prefer the artist who works with his vision to try and actually communicate one's ideas to an audience, rather than an artist who is content to live in his own mind and make it all about himself. This is a circuitous way of describing why I found the Gorillaz so refreshing. Too often in our society, it is all about the artist. Musicians, especially, create a brand for themselves. Personas are adopted, band names are trademarked, and a certain kind of lifestyle is marketed along with the music. The art and even the individual artists are subsumed under the name, which is why bands can keep selling tickets and albums long after they're creatively bankrupt - it's the persona that matters, not the sound. Artists sell their art, but they also sell an image of themselves. But the Gorillaz are, quite literally, cartoons. Yes, there's a few guys behind the figures who are the real composers and performers. But by crediting the music to these four virtual bandmembers, Damon Albarn and Jamie Hewlett are effectively deleting the need for big egos, musical rivalries and gaudy personas. Much like an author writing under a pseudonym, creating music under not just an alias, but a cartoon alias, means that all attention will be on the music. The Gorillaz might have started out as a cheap gimmick, a fun little add-on to what could have been a throwaway solo album by Damon Albarn. Instead, they've become a necessary mask. A real band might be constricted by audience expectations, expected to write music in a specific style or act a specific way. But a cartoon band can mix and match, draw from all sorts of influences without needing to be pigeonholed. There's no room for a cult of personality, because there's no personalities. There's only computer-animated primates. Making art without an actual artist is an incredibly liberating endeavor, and I think the Gorillaz have made the best of it. Maybe, one day, I'll be able to meet them and get their autographs. WHAT I KNEW BEFORE: For about a week of my sophomore year of college, every single one of my friends was listening to "Feel Good, Inc." But I hadn't heard much of the Gorillaz before that, and I haven't heard much since. MY LISTENING: I listened to Demon Days (2005) every day this week, interspersed with Gorillaz (2001) and the newly-released Plastic Beach (2010), each of which I listened to twice. WHAT I LIKED: I was on spring break this week, and I spend most of my days being a beach bum, speeding across the interstate with my windows down as I traveled from one vacation spot to another, crashing on hotel floors. It was a very laid-back week, and the Gorillaz were a perfect soundtrack. Their music has a post-apocalyptic vibe, but a chill one, as if the world has ended and since then everyone has just been jamming out to music (see: "Last Living Souls" and "Every Planet We Reach Is Dead"). And just like the conceit of Demon Days is an end-of-the-world concept, the Gorillaz' music also reflects this end-time mentality. Rock might be dead, but the group is picking through the remains, foraging for a little of this and salvaging a little of that. The music is pieced together with hip-hop, electronica, rock, psychedelia, and some good old-fashioned pop hooks. And though the music might be cobbled together from all sorts of disparate elements, that's not a bad thing. Rather, one of the strengths of the band is their ability to meld bizarre influences together. The music never sounds conceptually coherent, but that's the point. 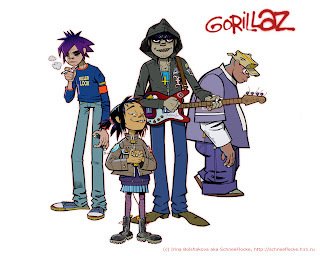 The post-band conceit also allows the Gorillaz to take advantage of all sorts of collaborators on different tracks. Rap outfit De La Soul is one of their more frequent partners, but the recent Plastic Beach also features artists as diverse as Lou Reed, Mos Def, the Clash's Mick Jones and Paul Simonon, and the Lebanese National Orchestra for Oriental Arabic Music. Hell, Demon Days features the bizarre song "Fire Coming Out of the Monkey's Head", with Dennis Hopper reading the lyrics of a fable about a village of monkeys living in harmony, and the whole album was produced by DJ Danger Mouse. If nothing else, these eclectic partners prove that the Gorillaz take advantage of the strengths of their teammates, whether they be musicians, producers, or just narrators. In the end, it's just catchy music that doesn't take itself too seriously, which is all you can ask from a band. Especially a band that doesn't, technically, exist. I know I just spent the past few paragraphs playing up the strengths of a band that draws from such a vast range of influences, and utilizing such a broad cast of collaborative characters. But while this is certainly a strength, it also means that Gorillaz albums are difficult to swallow whole. Their singles are great, but it's hard to look at their debut album Gorillaz as anything more than a bunch of Albarn's half-baked songwriting ideas strung together, which as many flops as their are successes. The successes, like "Clint Eastwood", will stay in your head all day. The flops are not bad so much as simply forgettable. Demon Days, on the other hand, coheres a little more strongly. I was initially disappointed with Plastic Beach, but as I listen to it for the third time while writing this, it too is beginning to gel for me. Perhaps the Gorillaz make albums that take time to fully appreciate? FUN FACT OF THE WEEK: A few years ago, the Gorillaz were planning to produce a full-length animated Gorillaz movie, produced by Harvey Weinstein and with Terry Gilliam involved in some sort of creative capacity. The idea was eventually shelved, which might be for the best, but there's always a chance that, with that group of people, the end result would have been really really good. FURTHER EXPLORATION WOULD ENTAIL: Blur would probably be the most logical step, as Damon Albarn is the primary songwriter for both bands. However, I already looked into them nineteen weeks ago, which means I'd probably start exploring some of the Gorillaz' collaborators. Like De La Soul. Maybe, just maybe, I'll even do that soon. BEST SONG YOU'VE HEARD: "Feel Good, Inc."
BEST SONG YOU HAVEN'T HEARD: "O Green World"
NEXT WEEK'S ARTIST: De La Soul.